We will contact with you immediately. Please fill all your passport details as form bellow and provide us what type of visa you would like to apply for such as 1 month single entry, 3 months multiple entry or others? All details must correct as in passport. We will not responsible for any trouble at the airport if you send us incorrect details. 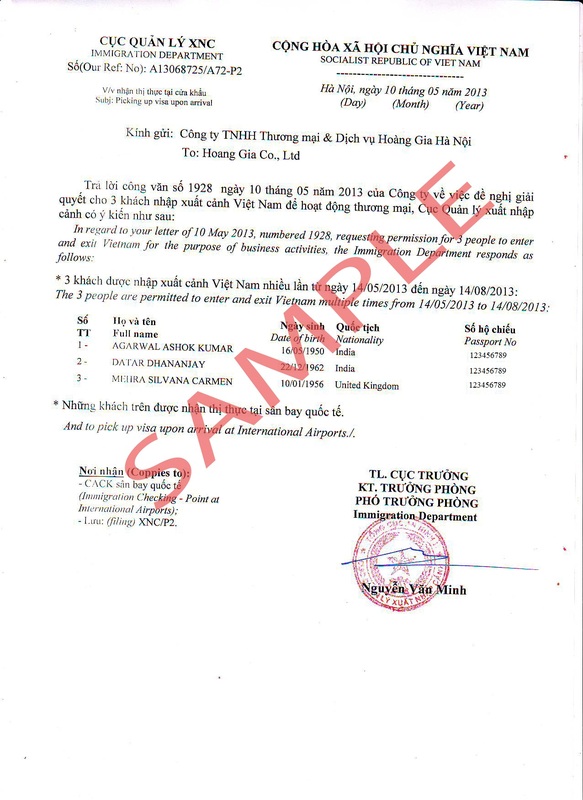 Please download, fill in and sign the Form in the attachment below before you arrive to Vietnam. It helps you save time, not need to stand in line to obtain this form at the airport. Please glue 1 photo at right top corner as the form request and prepare 1 additional photo same size for Visa Stamping requirement at Vietnam airport. 3. How do the Vietnam visa pre-approved letter and code look like? After you fill the form apply online and settle the payment successfully, we will process your visa within 4-48 working hours. Then we will send you pre-approved letter for picking up your visa upon arrival at the airport. Please make sure you must have the pre-approved letter & print it out for boarding the airplane and getting visa at the airport. You cannot board the airplane and get visa at the airport without the pre-approved letter.